In 1908, Anko Itosu sent a letter to the Education Department of the Prefecture. In that letter there was his project, which allowed to introduce his karate in all the schools of Okinawa. The fourth point of his letter highlights the importance of the makiwara in the practice of his karate. “Hands and feet are important and must be strengthened exhaustively with the use of makiwara. The practice of makiwara allows to lower your shoulders, open your lungs, become aware of your own power, strengthen your grip on the ground with your feet, transfer, and use the energy in the lower abdomen. Practice with each arm one hundred or two hundreds times”. Makiwara in Japanese means “to forge fists”. In practice,using a makiwara, you shape the parts that have to hit. 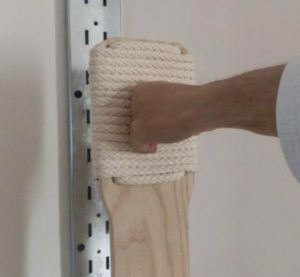 The makiwara is traditionally used to strengthen the techniques of fists or open hand, but it can also be used in order to train kicks. In this case the board must have particular charateristics. • Focus the look (metsuke) The makiwara helps develop concentration, to focus the technique on a point. If along with the body we involve the mind and the spirit in a single action, direct to hit a precise point of impact, it is sure that you will get an incredible result of power and penetration.